The advent of the technological revolution in all walks of life coupled with globalization, privatization policies has drastically changed conventional patterns in all sectors. The banking sector is no exemption. Poor mental health in the banking sector is high all time. Private sector bank employees have poor mental health and high depression level as compared to public sector bank employees. Banks have been going through enormous changes in terms of organization and structure. New technology and new ways of structuring the operation have left their mark on the working conditions and daily lives of employees. Increased competition, growing customer demands, prompt customer services, time pressure, digitization of all banking platforms, target and role conflicts are the main factors of stress to bank employees. Moreover added workload from the government like enrollment of Aadhaar card, bank employees being assigned duty during elections have put icing onto the cake. During the past decade, the banking sector had undergone rapid and striking changes like policy changes due to globalization and liberalization, increased competition due to the entrance of more private sector banks, downsizing, the introduction of new technologies, etc. Due to these changes, the employees in the banking sector are experiencing a high level of stress. More than two thirds (67%) of senior-level decision makers at financial institutions say they would consider quitting their jobs within the next year if stress levels do not improve, according to research by MetLife. Two out of five of every five banking executives describe their job as ‘extremely stressful’. These stresses contribute to decreased organizational performance, decreased employee overall performance, decreased quality of work, high staff turnover, and absenteeism due to health problems such as anxiety, depression, headache, and backache. 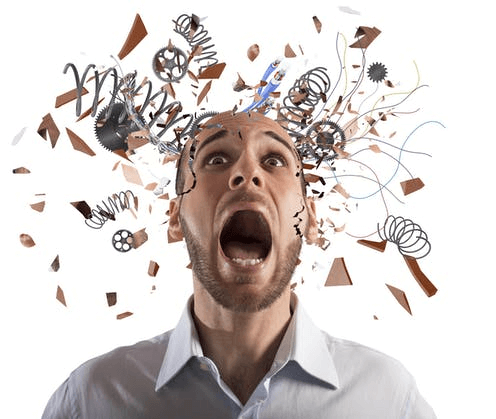 There are six components of job stress, i.e., lack of administrative support, excessive work demand, problematic customer relations, coworker's relationship, family & work-life balance and risk in the job. 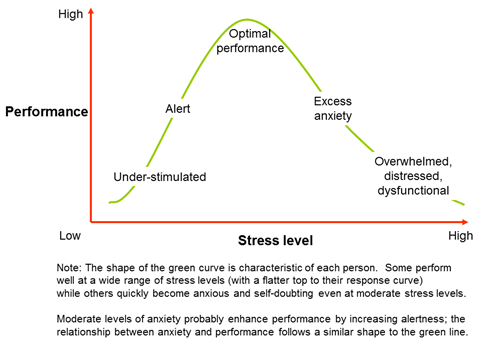 As can be seen from the graph the human brain and body can tolerate a certain level of stress, after which it starts to give up and leads to lower performance levels. Most of the bank employees are on an overwhelmed, distressed stress level which is leading to a lower performance amongst them. It's highly important to be open, clear and realistic about the goals of the business and how to achieve these goals. This gives employees peace of mind because they know what they need to focus on and why. Exercise is one of the best methods to reduce stress. It can help a person maintain mental fitness as well as physical due to an increase in serotonin levels, significantly improving a person’s state of mind. What’s more, it can reduce fatigue, increase concentration levels, and improve alertness. Every good work should be rewarded. If a worker does a good job, then you must tell them that you are impressed, whether it be in person or over email. When a worker feels valued, they feel as if their efforts have been recognized, and that the extra hours and hard work has been worth it in the end. Maintain a healthy leave policy and encourage employees to take their allotted time off. Encourage your employees to take some time off, spend with their families and go out for vacations. Get outside and engage with nature with your senses. Enjoy what you see, hear, smell, taste, and touch. Alcohol, smoking, and caffeine are a big nono. In the long term, these crutches won't solve your problems. They'll just create new ones. These might provide temporary relief, but it won't make the problems disappear. You need to tackle the cause of your stress. Working smarter means prioritizing your work, concentrating on the tasks that'll make a real difference. Your in-tray will always be full. Don't expect it to be empty at the end of the day. A person with inadequate rest is considered the same as if drunk with a bottle of whiskey. His consciousness and performance capabilities are sure to go down which can eventually lead to stress. A continuous sleep of at least 6 hours is required to have the mind and body go back to the same potential. Since your brain is made of 73% water, drinking it helps you think, focus, concentrate, and stay alert. As a result, your energy levels also improve. According to research, it doesn't take much to feel the impact of dehydration. Being dehydrated by just 2% impairs performance in tasks that require attention, psychomotor, and immediate memory skills, as well as the assessment of the subjective state.